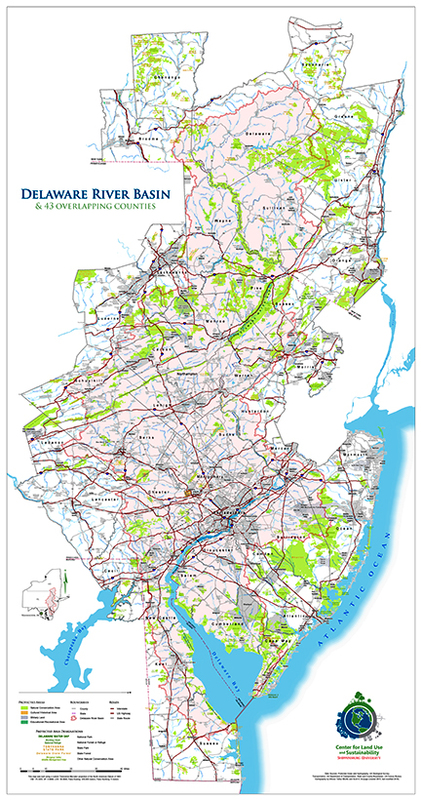 DRB2070 Version 2 represents a revised baseline forecast and two alternative forecasts (“corridors” and “centers”) of urban land cover in the Delaware River Basin (DRB) out to the year 2070. To develop these forecasts, we calibrated the SLEUTH urban growth model for the entire 43 county region of the DRB over the 2001-2006 time period, and validated the model for the 2006-2011 time period. Supplementary documentation: product description, DRWI webinar, and presentation slides. Our collaborators at the USGS modeled land cover to 2070 using the Chesapeake Bay Land Change Model. A comparison of these two products will soon be available to review. In the long term, we hope that our data can be integrated into the Stream Reach Assessment Tool. Let us know how you anticipate using our mapping and modeling tools! Data is also available for the Delmarva peninsula through the Chesapeake Conservancy. Use our interactive map to download the data for your county! Our research analyst has created fantastic maps of our 43 county study area to guide DRB2070 workshop discussions. A large format (30″x57″), highly detailed map (scale 1:350,000) of our study area is available for $40. See the example below and contact us for more information! Contact us to order this map! We are a small and dedicated group of scientists that is concerned about water and land use dynamics. Together, we have more than 50 years of experience mapping, modeling, and monitoring land use and land cover change in the United States, Europe, and South America. A watershed of over 13,000 square miles, the Delaware River Basin (DRB) provides water resources for roughly 5% of the US population. We aim to develop a land cover mapping, modeling, and monitoring system for the Delaware River Basin in support of maintaining and restoring water resources and to connect models of land cover change, climate change, hydrology and tree species to address the impact of future development and environmental change in the DRB. DRB2070 Version 1.0 Now Available!